I got the idea for a fish-pie crust from Jamie Oliver and it really works! I have found that the potato cream crust can be very rich and unhealthy for a weekday evening. That is why I like Jamie Oliver’s filo crust so much because it is light and harmless. 500 g smoked boned fish filets; any fish will do. I like smoked salmon or Cape hake. Heat a bit of olive oil in a pan. Fry the spring onions, peas, green asparagus, dill, salt and pepper together in the pan. Lower the heat. Add the smoked fish, baby spinach leaves and milk. Simmer for 10 minutes, add the cheddar cheese and stir through carefully. Spray a round pie dish with Spray ‘n Cook. Transfer the contents of the pan to the pie dish. Break rough strips of the filo sheets over the fish pie. Make sure the filo sheets cover the whole pie and overlap in a few layers. 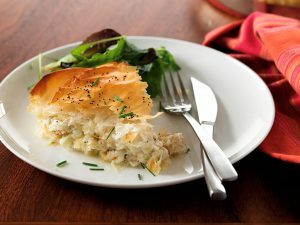 Spread egg over the filo pastry and sprinkle more grated cheddar cheese on top. Bake in the oven for 20 minutes or until the filo pastry has turned golden brown.